I read an article by Chris Pereira the other day that made an attempt to link the recession to video game usage. In fact, the subtitle is: "With economy troubles, gamers are buying a larger percentage of used games." While there is a link between video game usage and the current recession, this a pretty bold statement given the analysis presented (which Chris built on from a Time magazine article). I'll show you my evidence that backs up Chris in a bit. 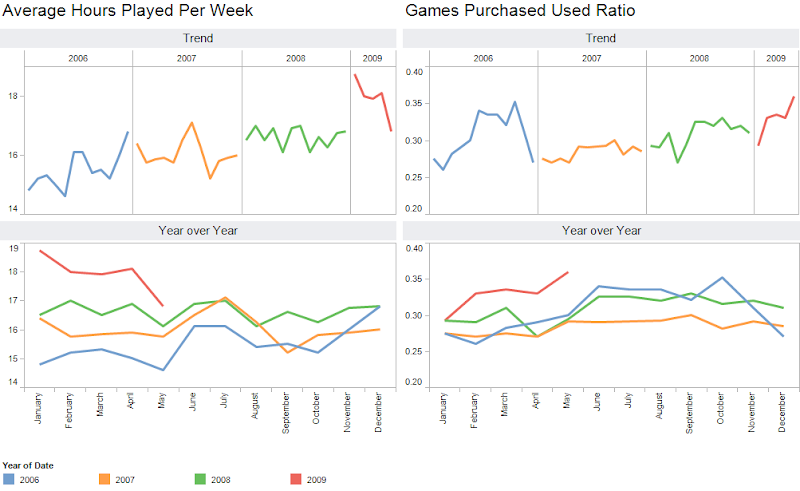 The first chart presented by Chris (via Nielsen) analyzes video game usage trends over the last four years. I don't think this chart proves anything more than the fact that video game usage has increased year over year for the last four years...that's it. You simply can't say that the upswing in time spent playing video games in 2009 is due to the recession. The second chart tries to make the same correlation, but again, I see the same type of trend from 2007-2009 that you see in the first chart. People are just playing more variety of games...that's all. There is absolutely no way from this chart to draw a conclusion that used video game sales are in any way related to the recession. Ok, so how can I say that it's just a matter of fact observation? Look at this chart (created with Tableau). If you look at the four year trend of hours played, there is a continuous increase is hours played. You might say "I don't see this in 2009." But in each year in May, you see a big decrease in hours played. As Chris says in his evaluation: "May has traditionally seen a drop-off each year (blame the improving weather)." I can see the reasoning there. 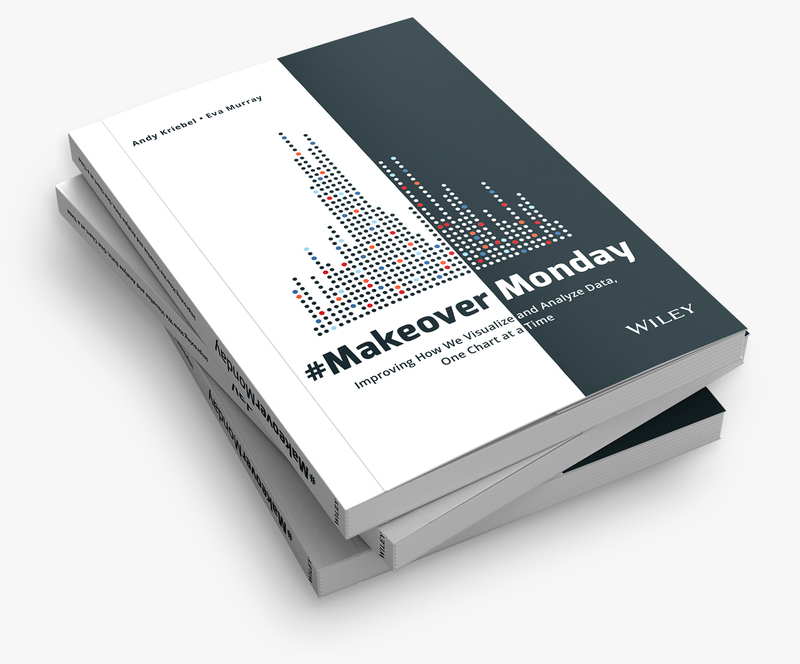 You can also see that from 2007-2009, a similar trend can be derived from used game sales. 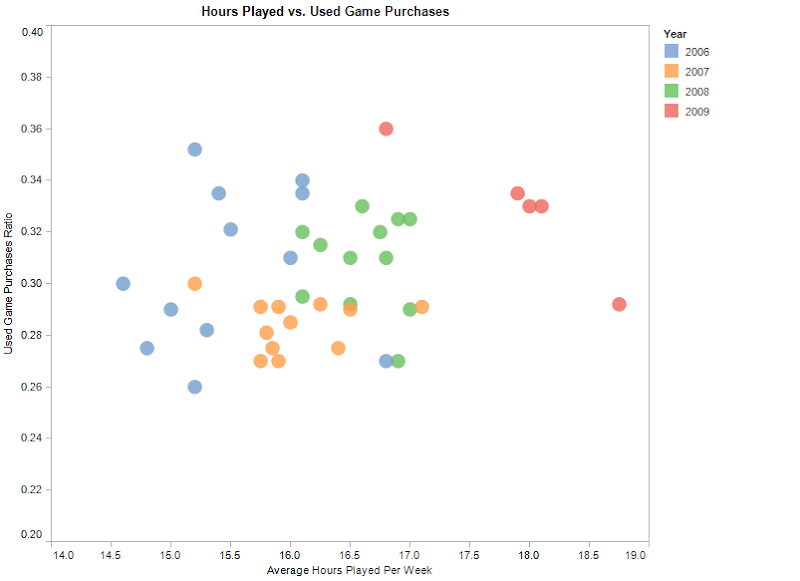 I tried to find a correlation between hours played and used game sales (since the article says both are related to the recession), but the facts don't support this. I decided to look at other factors that could correlate the recession to video game hours played to help support Chris' argument. 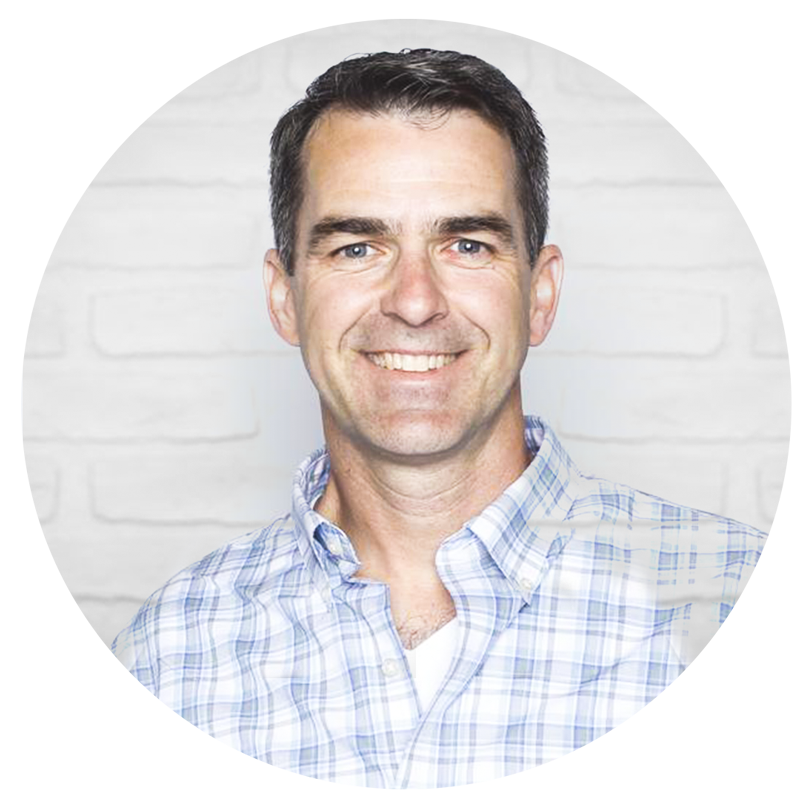 We have been hearing quite a bit regarding the housing crisis and it's impact on the economy. I gathered economic data from FRED and was able to demonstrate that a prolonged decrease in housing starts does indeed indicate that a recession is coming. 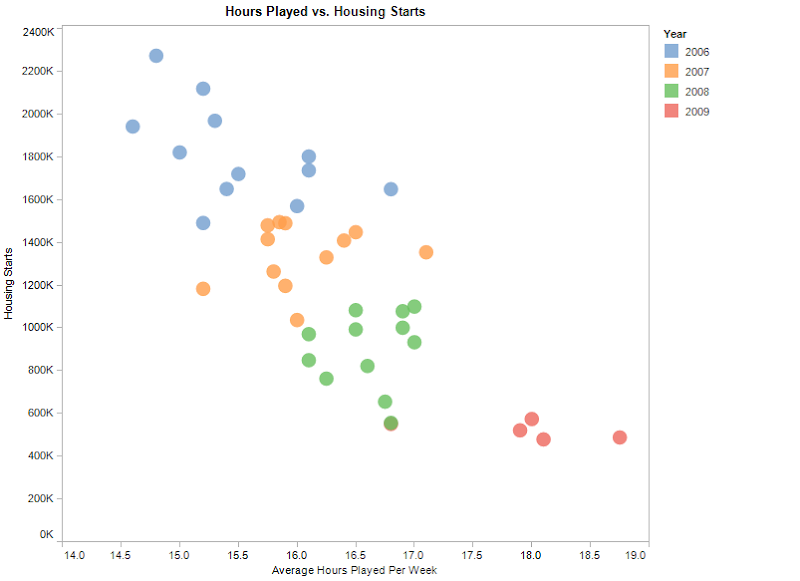 My next step was to identify correlations between housing starts and the increase in video game hours played. Based on this analysis, I believe that a much stronger argument can be made the an increase in hours played is a possible indication that a recession is taking place. I set the "hours played" scale to match the Nielsen Data. I find the color-coding of the years very useful and, to me, the relationship can be clearly seen. As housing starts decrease, video game hours player per week decrease. 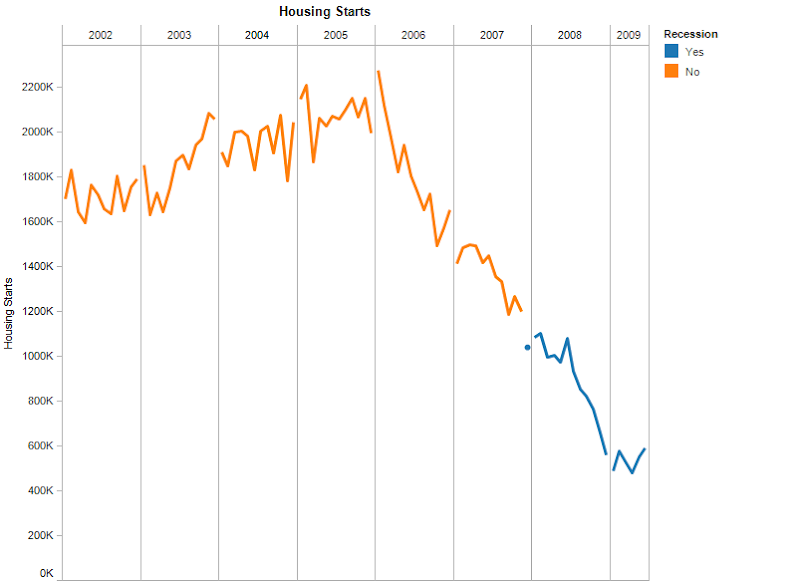 Since the years are color-coded, you can tie them back to the housing starts/recession trend chart above. What's the bottom line? I agree with Chris that there is a relationship between video game hours played and the recession, but the way to get there is much more conclusive if you use economic indicators to support the theory.